Things have been rather slow in comparison the last couple of days. They did finish up the front of the building (except for where the bay doors are supposed to be) and framed up the bathroom/stairway area. Today they installed the garage bay door headers and removed the temporary walls they had put up yesterday. 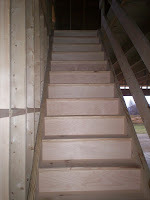 They also finished up the roof sheeting, installed the steps going to the upstairs, did the flooring for the upstairs, and cut out the upstairs outside doorway opening. Roof trusses going up. Beauty. They also started framing the upstairs (which occupies the space inside the trusses). The places where the garage bays are designed to go are supposed to have load-bearing headers above them to hold the trusses up, but the headers hadn't arrived by the time the crane got here to lift the trusses in place. The delivery person said they had delivered them, but it must not have been to our address as they weren't here. 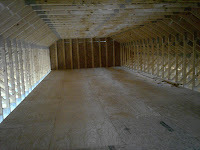 The carpenters decided to put up a temporary wall there instead so that they could process with the trusses. You can see them putting that up in the first photo. The headers actually showed up later in the day but ended up being the wrong ones. When the proper headers finally do arrive, they will have to support the trusses while they remove the temporary wall and put in the headers where they belong. Whew. The bay doors will be walled over for our purposes, but I wanted the underlying structure to be there for the garage bays so any future owners could always convert the building into a normal garage without any fuss. That should make selling the house easier if we ever get to that point. I have to say that the building is MUCH bigger in person than it appears to be in these photos. Today's pictures. Just the framing getting finished up so the trusses can go up Monday. Construction Update - Framing Started. 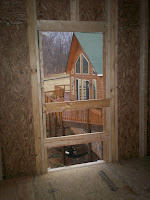 The framing started today, and was almost completed. They said they'd be back tomorrow or Saturday to finish up the last of it. Monday the crane is scheduled to be here to put in the roof trusses. They also started putting up the exterior sheets of wood that make up the outside wall. Wow, 12' ceilings are really high. Did you know that? When you stand in the middle of the building now it looks big!!! We aren't sure where we want the entryway door yet, so they just put the proper framing in both places we are thinking of putting it. There is a small problem with putting it where we initially wanted it because of the electrical panel. The county code says the door can't block the electrical panel when it's open. We're still figuring it out.